Preventing fires in commercial properties is one of the most important safety responsibilities of being a building manager. It’s important to have a fire prevention system in place, a properly installed and maintained fire alarm monitoring system, and an emergency escape plan. Once your fire alarm system or fire alarm monitoring system has been installed, arrange with the technicians to have it regularly serviced for maintenance. Regular inspections of fire alarm systems and fire alarm monitoring systems have been shown to reduce service calls and false alarms. A fire risk assessment should also be performed on the building in order to determine how often your fire monitoring service should be serviced. By ensuring that your fire alarm and fire monitoring system is up-to-date, you know that it will be there when you need it the most. Make sure employees are educated on fire prevention. Keep fire safety tips posted where they are easily visible, especially around large appliances that may pose a risk. Have regular fire training sessions with employees so that everyone knows what to do in the event of a fire, and ensure everyone is aware of the location of fire extinguishers, fire exits, and fire alarms. Commercial building fires can be caused by heaters, furnaces, boilers, or electrical equipment that does receive regular maintenance. Prevent fire by having this equipment properly installed, and regularly maintained. Additionally, make sure that employees who will be using or working near this equipment are properly trained and know what to do should the equipment malfunction. Arson is a leading cause of commercial building fires. Arson is extremely dangerous, as arsonists often plan fires for maximum damage. As a property manager, you should make sure that suspicious behaviour is being monitored and reported immediately. Installation of intruder alarms, and security cameras can help protect against arson. Any visitors to the building should be required to sign in, and employees should be encouraged to report any suspicious behaviour. As a commercial building manager, these fire safety tips should help you prevent and monitor fires. No matter how many preventative measures taken, there is still always a risk of fire. The most important thing during a fire is that the people in the building get out safely. So have a fire plan and regular fire drills to ensure employees know what to do in an emergency. The more education about fire safety that you can provide, the better, because it truly saves lives. 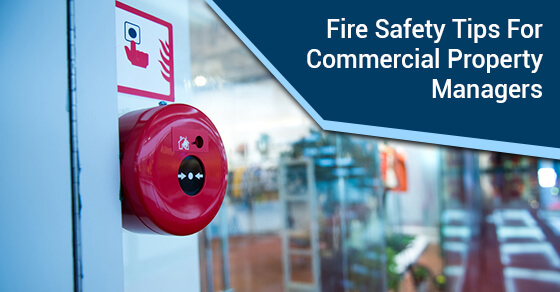 To upgrade the fire alarm monitoring system in your commercial building, call us today at 888-784-9709 or request a quote here.